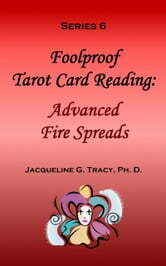 Regardless of where you are on the path of Tarot Card learning, this book, Series 6 in a series of 9, will add more spreads of the Advanced Fire nature to your repertoire. If you are a neophyte, then it is recommended you get "Series 1 – Foolproof Tarot Card Reading: A Neophyte's Delight." It is the foundation designed to get you started. You may never have even seen an entire deck of Tarot cards, but are intrigued by the possibilities they may hold. Without memorizing hundreds of meanings for the entire deck, you will be able to hold Readings for yourself and others that will be informative, simple to understand and give new hope and directions for a better future. Series 1 book will K.I.S.S. the procedure. It is a Neophyte's Delight. Then you may want to get the Intermediate Series (2 – 5) before tackling this Advanced Series (6 – 9). If you are already an expert Tarot Card Reader or are well-aware of the Reading process, then Series 1 will have parts that are "Ho-hum!" or "Duh!" But it may very well be an opportunity to fine-tune your Reading practices. You can keep your Querent engaged in the process without it being overwhelming. And there's always something new to learn! Series 6 is mainly a collection of Fire Spreads of the advanced variety. Fire Spreads are designated by using RED as their color-coding, they have a common theme of human experiences, and these are divided into three subdivisions. Series 6 is designed so that Tarot Card Readings can be done by using Fire Spread diagrams, charts, worksheets and color-coding in such a manner that the Querent will be able to follow along with you as the Reader. The sad need for a disclaimer statement will be reviewed. A sample disclaimer for your use is given for you to personalize. The seriousness of each Reading Session will be reviewed. Reading Sessions are important to the Querent. They are not to be taken lightly. The deck being featured in this series is the "Tarot of Dreams" deck by Ciro Marchetti. This deck is unique in that it contains 4 extra cards, called Palace Cards. This brings the deck to 82 cards instead of the traditional 78. This chapter will summarize these cards for you to integrate into your Readings if you so choose. The Significator is an integral part of the Reading. This chapter outlines what a Significator is, why it is important, and various ways that a Significator can be chosen. While there are many possibilities, by answering a few simple questions on the now fully expanded "Questionnaire Worksheet," the choice can be narrowed down fairly quickly. Full charts for these choices are repeated for continuity from Series 1 - 5. In addition to the ways already briefly reviewed, the choice by Zodiac (Sun) Sign is now included. It involves more understanding of the Court Cards, suits and their corresponding element, and the integration of 12 of the Major Arcana with Astrology, so it, therefore, is more advanced. A chart is included so the choice can be easily found. This will introduce advanced Fire Spreads to you that are used during a Reading to focus on a particular aspect that is in need of an answer. An example is detailed for you so all spreads can be easily followed. How spreads are categorized by Fire, Water, Air and Earth, and their subdivisions are charted. How to choose the right spread is also important, and procedures are given. Why the questions or directives are formed the way they are will be clarified. Forbidden spreads for you and/or the Querent will be explained. Fire Spreads are divided into three subdivisions: Career/Job and Teamwork; Inspirational, Spiritual: Karmic Past. Tarot: True Tarot Card Readings: The Easiest Way to Learn the Tarot Ever!